“I think that I shall never see / A poem lovely as a tree,” American poet Joyce Kilmer famously wrote. Perhaps he had an eastern sensibility, because in parts of Asia, trees are often considered to be poems, worthy of admiration and contemplation. But not any old trees: humans must have a hand in their creation too. Although English uses the Japanese term bonsai, miniature trees were first created in China, where they are called penjing. Both terms simply mean ‘tray planting’. The creation of miniature landscapes in shallow pots has been part of the Taoist tradition in China since at least the first century, and by the third century was a well-developed art praised in essays and poetry. I became quite entranced with these from the moment I saw them in gardens in Shanghai and Suzhou, both shore excursions on some Yantgze river cruises. The misty landscape of Huangshan in China. Anyone familiar with some of China’s most famous landscapes – or the traditional scroll paintings that portray them – will see the inspiration for penjing. 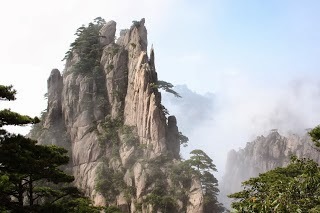 Huangshan in eastern China, for example, is the perfect blend of natural beauty and human ingenuity. Emperors and poets have lauded the mountain range’s misty landscapes, gnarled pine trees and teetering rock formations, while a thousand years of labour have gone into creating its dizzying pathways and staircases. Although penjing attempt to capture such scenes in miniature, there’s much more to them than simple imitation. This is an art form that reflects the patience and ingenuity of the grower, and provides a source of delight and contemplation for the viewer. Some have called them living sculptures or three-dimensional poems: compact, beautiful and intended to provoke quiet contemplation. The plants are also carefully chosen for their symbolism. Pine and cypress trees are appreciated in Chinese culture as symbols of longevity and strength. Plum represents vitality and peach immortality, which is why these are common penjing fruit trees. From the penjing of China two other traditions also emerged. In Vietnam hòn non bộ came to focus on creating entire miniature landscapes of mountains and islands decorated with a variety of small plants and trees, and often also containing model figures and buildings. If you’re river-cruising on the Mekong, you’ll see plenty of these at temples and gardens along the way. Japan also developed its own sense of aesthetics and tradition. Penjing were brought to Japan as early as the sixth century, but it wasn’t until the fourteenth century that Japan was producing its own penjing and the first truly Japanese bonsai were born. Unlike the Chinese or Vietnamese traditions, bonsai focused on single plants rather than landscape settings. They were widely admired and kept by the samurai class. The oldest bonsai in Japan, a five-needle pine tree at least 500 years old, is part of the imperial palace collection in Tokyo. 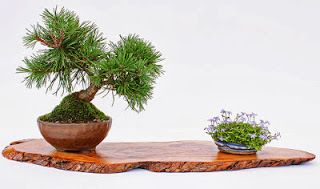 Quite apart from their petite appearance, there’s more to the look of a penjing or bonsai than at first meets the eye. 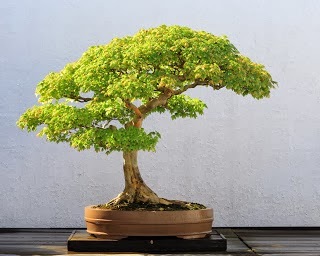 Proportions are paramount, since the bonsai must mimic the appearance of normal trees with trunk, branches and leaves in proportion to each other. It must appear natural – if wired or pruned, no visible sign must later remain. And asymmetry is favoured, so that a bonsai usually has a clearly defined ‘front’ from which it is best admired. 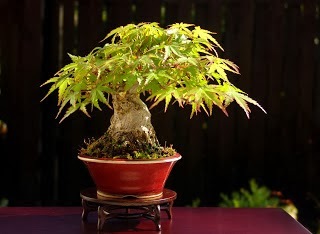 Bonsai are usually planted in ceramic pots and displayed at eye height, alone and against an un-distracting background. However, some indoor varieties are arranged on a little landscape that may feature a companion plant, some rocks, and perhaps an accompanying scroll painting hanging nearby. They’re designed to make the viewer pause in admiration at the sight of a beautiful branch of autumn foliage or the twisted elegance of a tree trunk. If that makes you feel a little philosophical or poetical, then you’ve understood what bonsai is all about. Are you familiar with bonsai? Keep an eye out for them on your next Mekong or Yangtze river cruise, and let us know what you think.